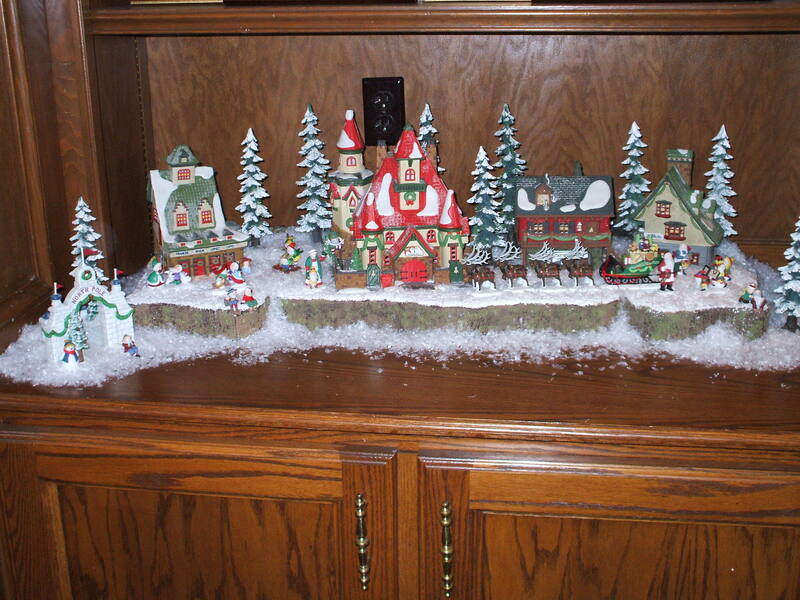 As previously mentioned in Part One of My Christmas Decorations From Past Years series, I like to challenge myself every holiday season by using my Christmas decorations in different ways and sometimes in different rooms of our house every year. Shown in the photos below are a variety of decorations from several years of Christmas past. 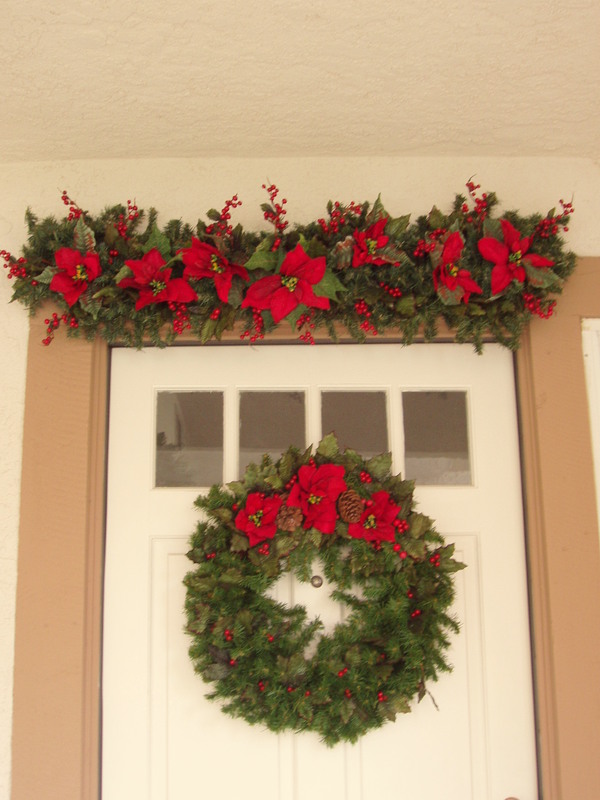 Besides using pine garlands in the interior rooms of the house, I also used them to decorate the front door of our home in California. To start the display, I hammered in several nails above the front door which I used to hang an artificial pine garland which I decorated with several artificial red poinsettias and sprays of red berries. I also hung a large artificial pine garland decorated with more red poinsettias, sprays of red berries and real pine cones. 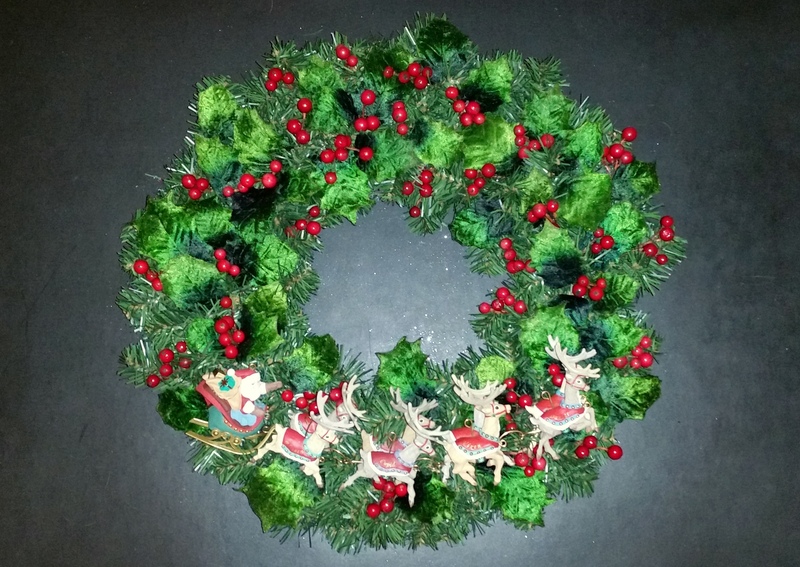 Artificial pine sprays are also a versatile Christmas decorating accessory that can be used to create wonderful displays in a home. 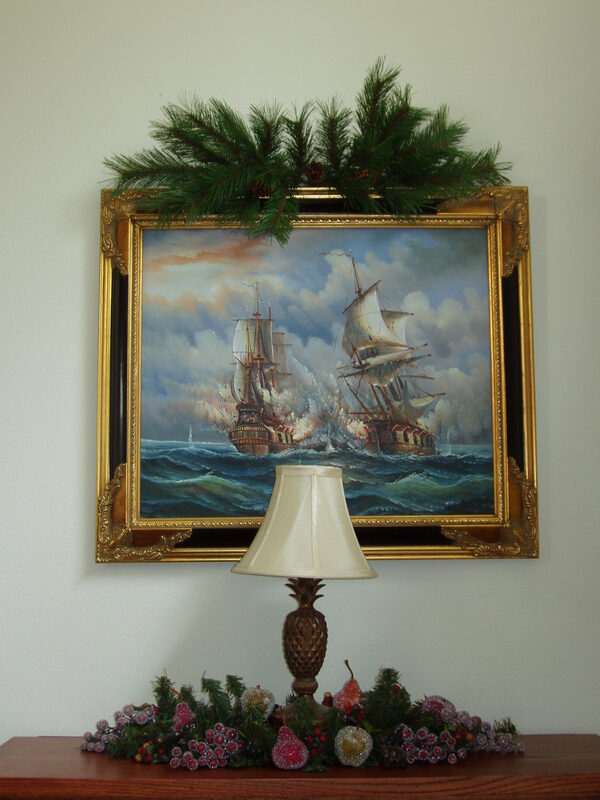 During the holiday season I use several pine sprays that I place behind the picture frames of several pictures in the family room, library and dining room throughout the years in both our former California and our new home in the Midwest. Some of these pine sprays that I have used are plain and others have pine cones attached to them, I have also added red berry sprays for additional decorations. 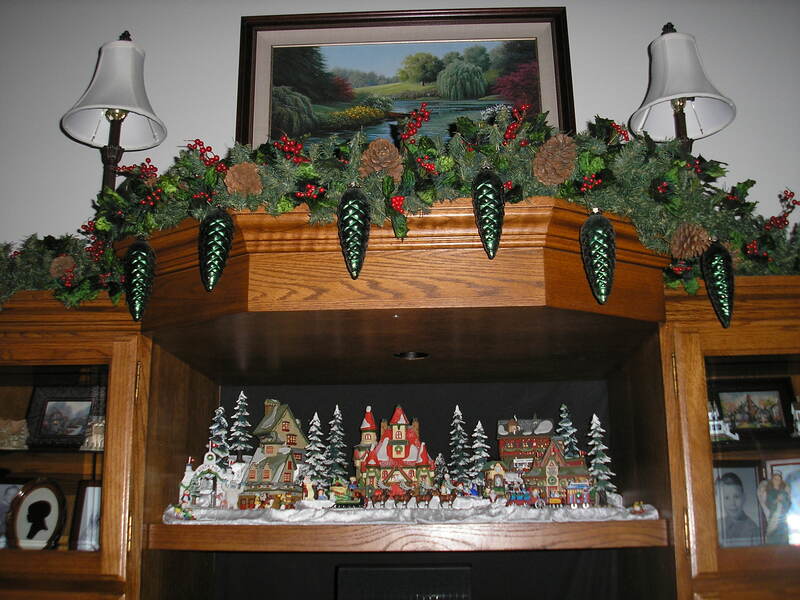 I have also used artificial pine sprays to decorate the tops of tables, curio cabinets, fireplace mantels and even kitchen cabinets. 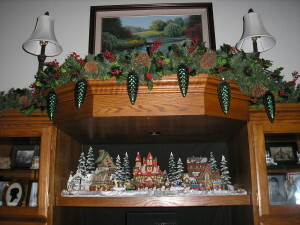 One year I decorated the pine sprays on the top of the tall cabinet in the dining room with the artificial “sugared” fruits that matched the pine garland I used above the china cabinet, the photo above shows the display. Finally, the following year I decided to do something a little more elaborate to include a special Christmas sign that I had recently made. 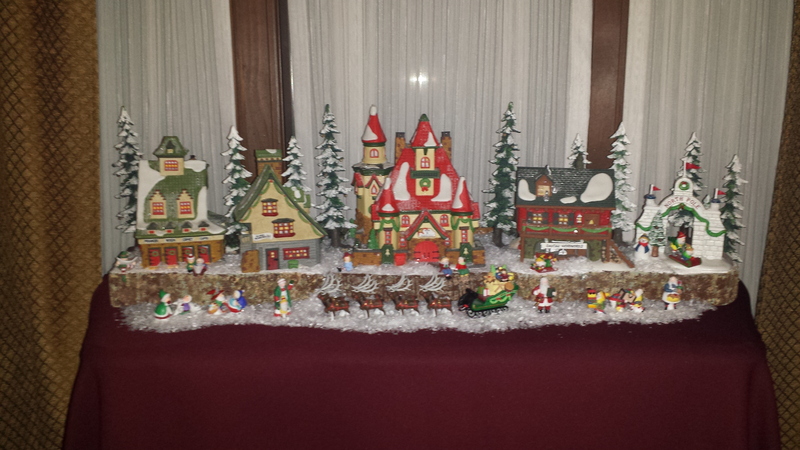 In previous years I had usually displayed my Dept. 56 North Pole Village in the built-in bookshelf to the side of the fireplace but this time I set up the North Pole display on the mantel. 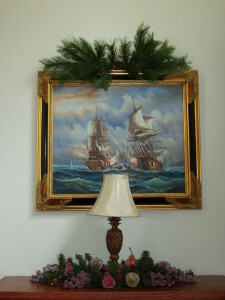 Even more tabletop Christmas trees have decorated the various rooms of our house throughout the years. In the entry way on a wooden bench I have displayed a Santa in a beautiful white embroidered cloak with two elves. In another room is another tree placed on the fireplace hearth with an old fashioned Santa dressed in lovely red velvet cloak with two reindeer. 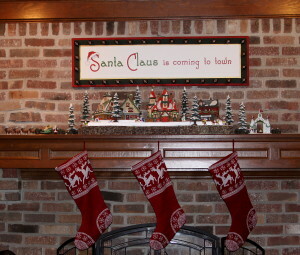 In the dining room on the chest of drawers is a porcelain dark-haired doll dressed in a red wool coat, hat and black fur muff and displayed with a reindeer and a wooden sled. 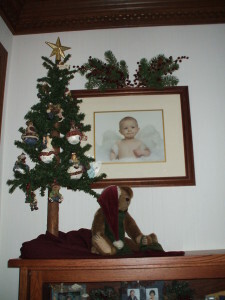 Even in the bathroom there is woodland small Santa dressed in a green corduroy coat with a fishing creel with a small Christmas decorated with red berries and a gold star on top. 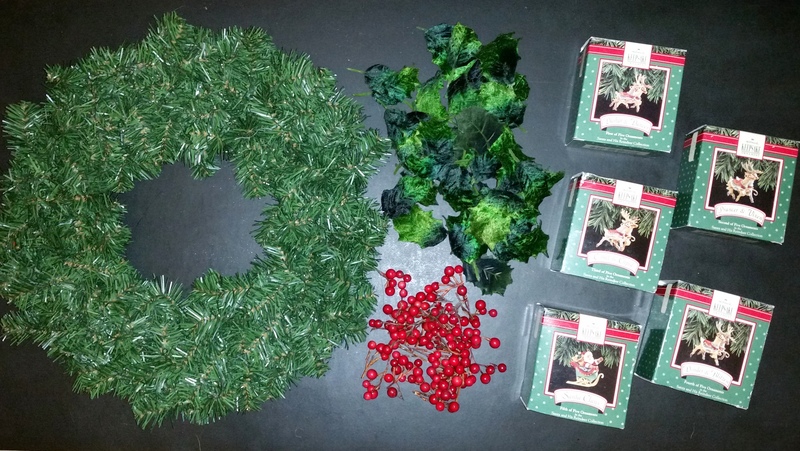 I have also repurposed my holiday decorations from other displays from previous years to use as decorations for several more tabletop trees. 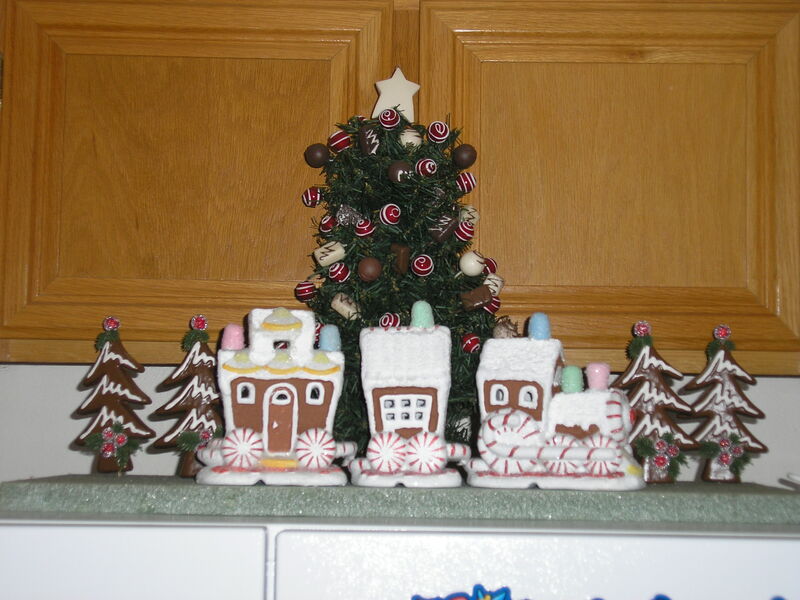 Above the refrigerator in our California home I decorated a small Christmas tree with chocolate candy ornaments that I had used the year before in the pine garland over the kitchen window and finished the display bay placing a gingerbread train in front of the tree. Another tabletop Christmas tree is decorated with the Boyd’s Bears ornaments that I had previously used on the fireplace mantel in our California home. 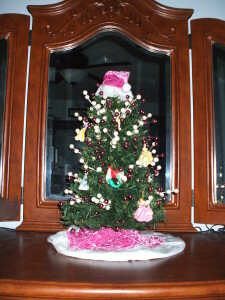 In keeping with the bear theme, the next year I decorated another Christmas tree with small stuffed teddy bears. 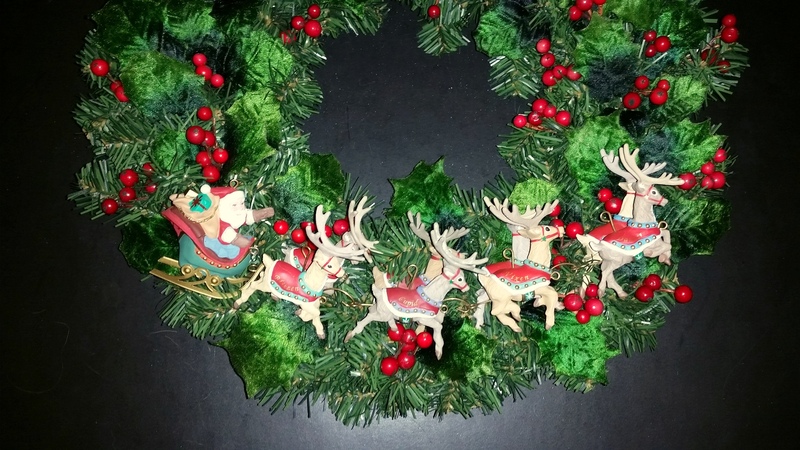 As I mentioned in this month’s Décor post, Ornaments Used in Unusual Ways, ornaments are not just for the Christmas tree and they can be used in many different ways throughout the house during the holiday season. In this post I will show three examples on how ornaments can be displayed in some fun and creative ways. The idea for the Ornament Snowglobe is to use an ornament that can create a winter scene and then be able to turn the jar upside down for the artificial snow to create a falling snow effect. 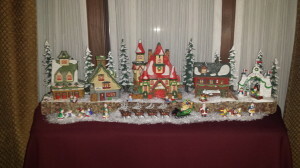 The gingerbread house is a great example to use for this craft project, other ornament suggestions are: a Santa Claus ornament, a Snowman ornament or a single Christmas tree. For this display I used a small glass container with a lid, a gingerbread house ornament, some artificial snow, and a glue gun/glue sticks. Craft Note: When purchasing an ornament for this craft project, be sure that the ornament is small enough to fit inside the jar with the lid closed, also check the width of the ornament so it can fit through the jar’s opening. 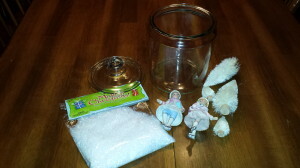 To start, be sure the inside of the jar is clean and remove any price tags or metal display loop from the top of the ornament. To remove the display loop, grab hold of the loop with a plier and then twist with an upward movement. Secure the gingerbread house ornament to the bottom of the jar with glue. 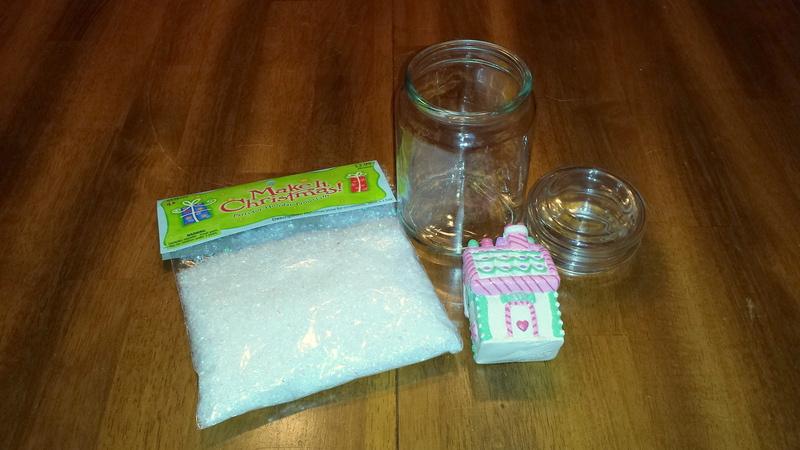 Optional step: For a permanent “snow base”, lay some cotton balls or batting onto the bottom of the jar after attaching the ornament OR paint the bottom of the jar with white paint and let it completely dry before attaching the ornament. 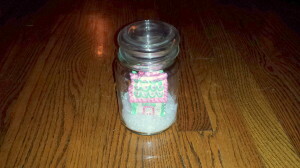 Next, add a small layer of artificial snow to the bottom of the jar. Then, to finish the ornament snowglobe, securely glue the lid onto the top of the jar so that the jar can be turned for the “snow effect”. For this display it is important to use ornaments with flat backs, such as the deer or gingerbread ornaments seen below. I used a wallpaper remnant (but scrapbook paper can also be used) for the background, a frame that matches the ornament and a hot glue gun/glue sticks. 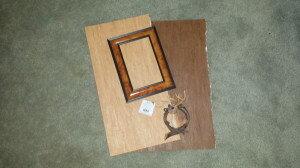 Disassemble the picture frame, separating the glass and back from the frame. Cut the wallpaper remnant (or scrapbook paper) to fit the size of the frame. Then, glue the paper to the glass. Re-assemble the glass and the frame backing inside the frame. 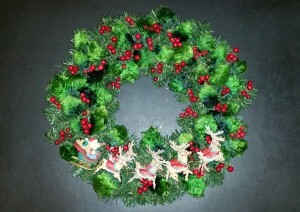 To finish the display, center and attach the ornament to the paper. Craft Note: The theme of this Framed Ornament is not specific to any holiday and would look wonderful on a side table or bookcase and can be displayed year-round. 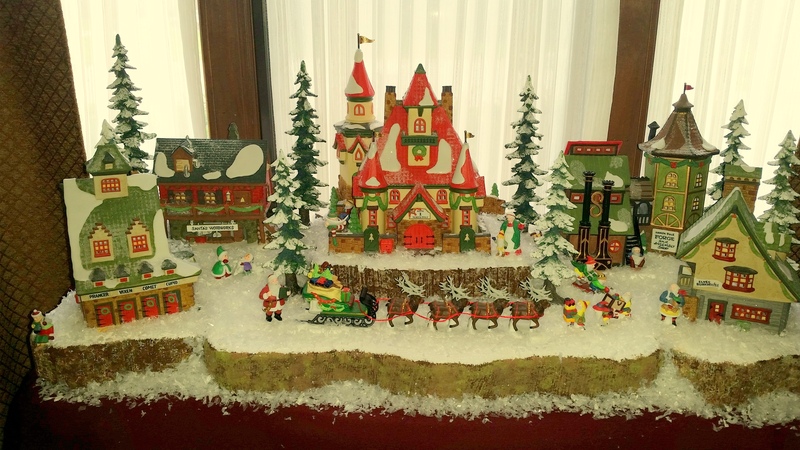 This project is similar to the ornament snowglobe but the difference is that this larger display can only remain stationary and uses multiple ornaments or accessories. 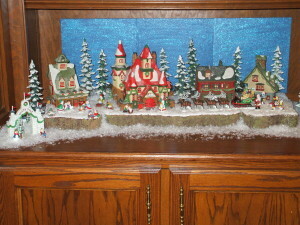 For this ornament display I used a large glass container with a lid, a boy and girl skater ornaments, four small artificial pine trees, artificial snow and a glue gun/glue sticks. The idea for this craft project is to have one or two ornaments and use accessories like trees and artificial snow to set a winter scene in soft pastels or whimsical with primary colors. To start, be sure the inside of the glass container is clean and remove any price tags or metal display loop from the top of the ornament. Next, position the accessories, such as the pine trees, and secure into place at the bottom of the glass container with the hot glue gun/glue. 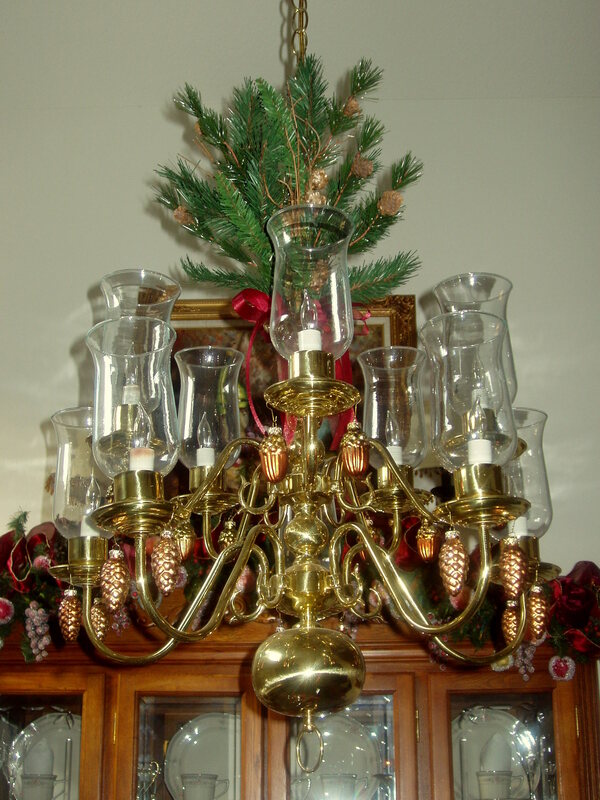 Be sure to leave room for the ornaments by positioning the accessories to the sides of the container and leave the area in the front clear to view the scene inside. 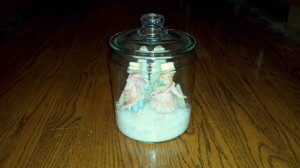 Then, secure the ornaments into place at the bottom of the glass container. 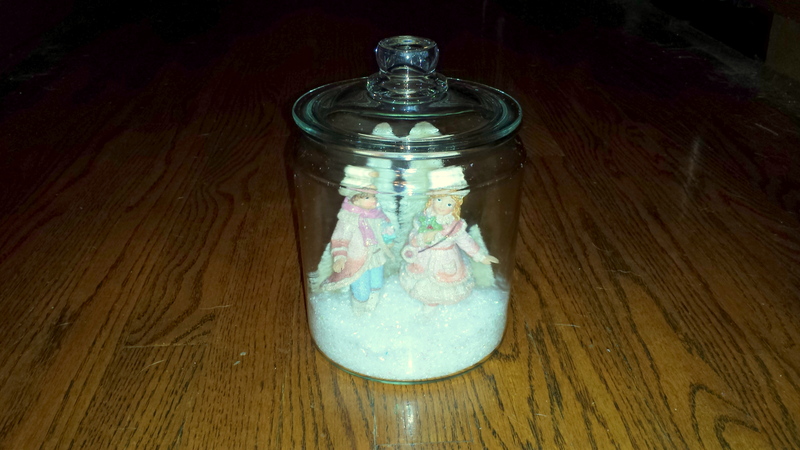 To finish the Ornaments Under Glass display, add a small layer of artificial snow to the bottom of the container to look like fresh fallen snow. So, next time you are shopping in the local retail or craft stores during the holiday season check out the Christmas ornaments and think about a different way of displaying them in fun and creative ways! Several years ago I was trying to think of a creative idea to decorate the chandelier in our dining room. It was a beautiful bronze multiple light fixture with lovely curved arms. Inspired by seeing other chandeliers with hanging crystals, I thought for the holiday season I would hang small ornaments to add a festive look. I found some small glass pinecones and acorns at a local retail store and I thought they would be perfect. 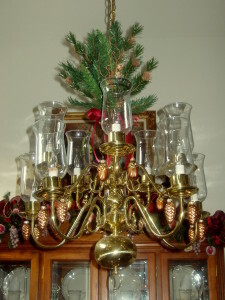 I hung them from the chandelier’s arms with small ornament hooks. 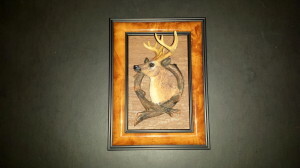 Another way to hang them would be to use ribbons or silk cord. 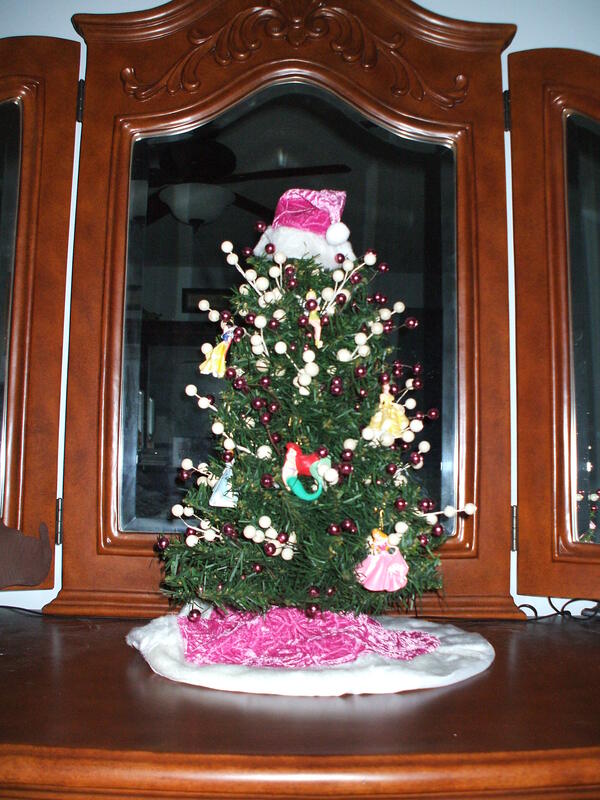 So, during the holiday season look for smaller ornaments that fit your holiday decorating theme – maybe candy or gingerbread ornaments, small porcelain or glass snowflakes, small ball ornaments in red and green or silver and gold. 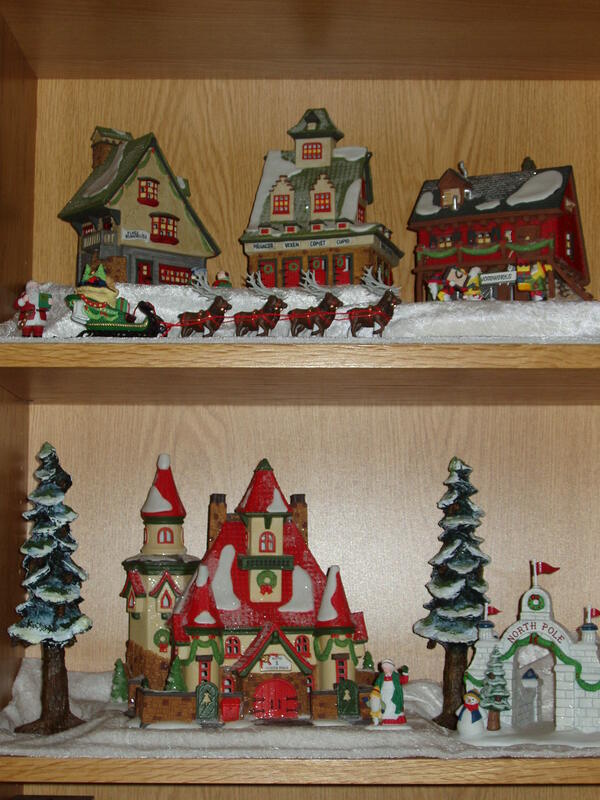 The retail and craft stores have a wide selection of ornaments – shop the sales to keep the cost down – be creative with style and color!! 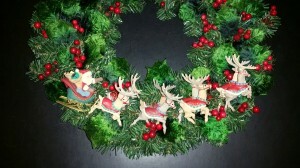 I had purchased several beautiful ivory porcelain ornaments for an unbelievable price at an “After Christmas” sale one year but I didn’t know exactly how I was going to use them. 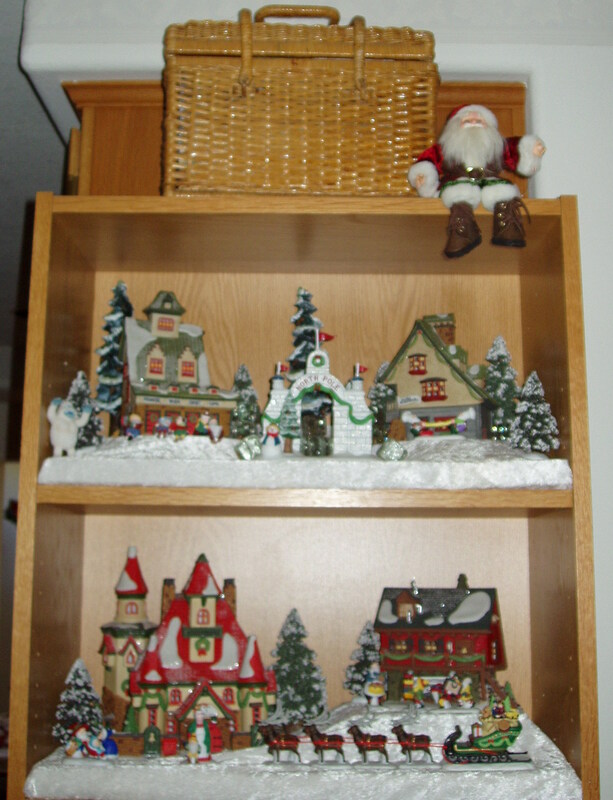 I had them in my Christmas storage box for a couple of years, just waiting for the perfect idea. Finally, I was trying to find a way to decorate our windows and I thought the ornaments would add just the right festive touch. With the curtain pulled slightly back and creating a beautiful frame for the windows, I hung the ornaments from the curtain rods at various lengths with thin ribbon in a matching ivory color. It was the perfect holiday decoration for the windows! 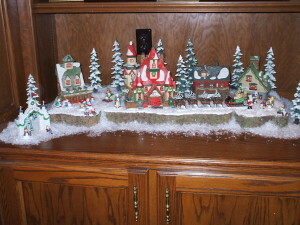 Years ago my Mother gave me several old ornaments from our family Christmas tree. I never knew what to do with these ornaments because they were very old, made of vintage glass and I didn’t want them to break. Since my Mother passed away this year, I decided I wanted to do something very special with them. An ornament shadow box seemed like the perfect way to showcase and keep them protected. 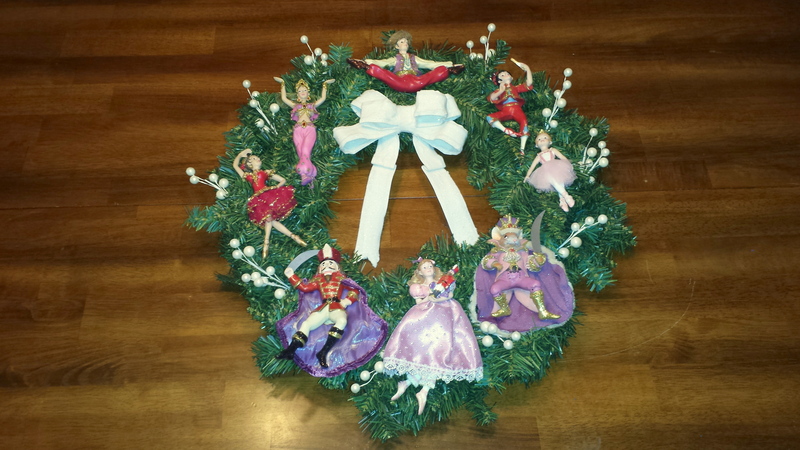 If you have a family heirloom ornament or an ornament too fragile or valuable to hang on the Christmas tree, or a unique hand-painted, one of a kind ornament – consider displaying it in a shadow box. 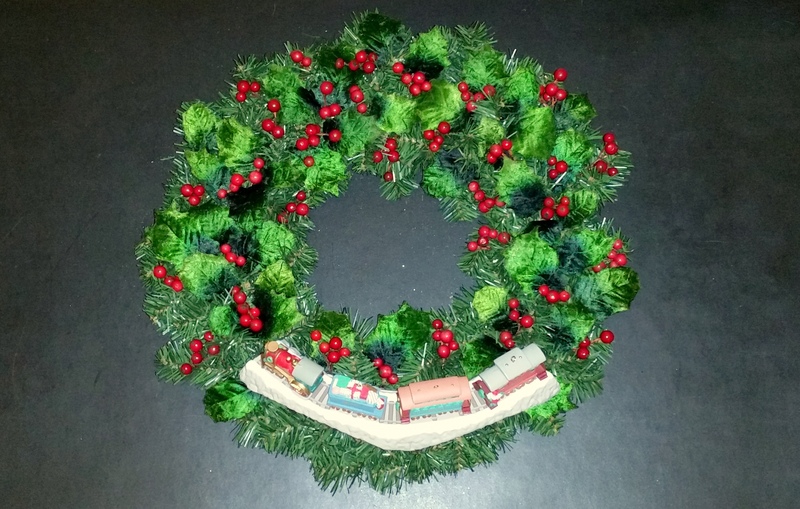 Some ornaments are so beautiful or have such special meaning – why only display them for such a short time at Christmas when you could enjoy them throughout the entire year! 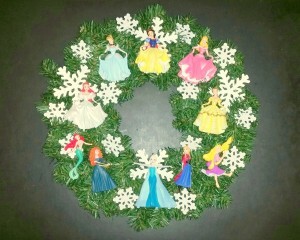 Sentimental ornaments would also be wonderful in a shadow box. 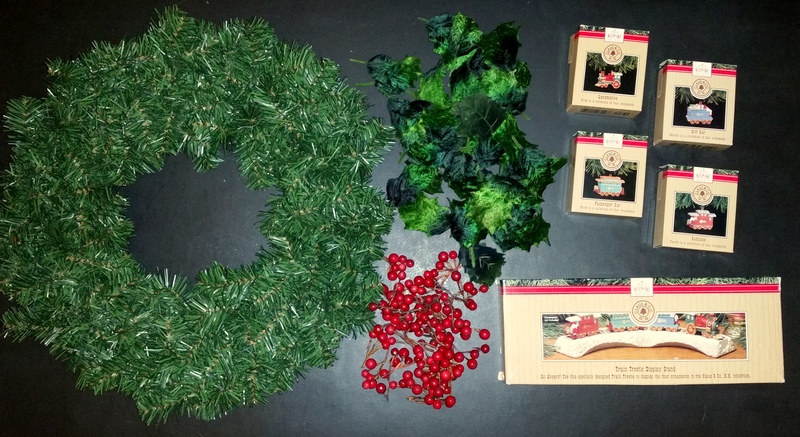 Consider these ways to display them year-round. – a baby’s first Christmas ornament could be hung in the nursery – a baby blanket could be used as the background and cut to fit the size of the frame. A special shadow box ornament would also make a wonderful gift to celebrate life’s special occasions, like a first Christmas ornament for the newlyweds, or to celebrate a new home, or a special milestone anniversary. There is usually such a nice selection of ornaments available for the holidays, so when you are out doing your Christmas shopping look for unique one of a kind ornaments to give as a special gift. 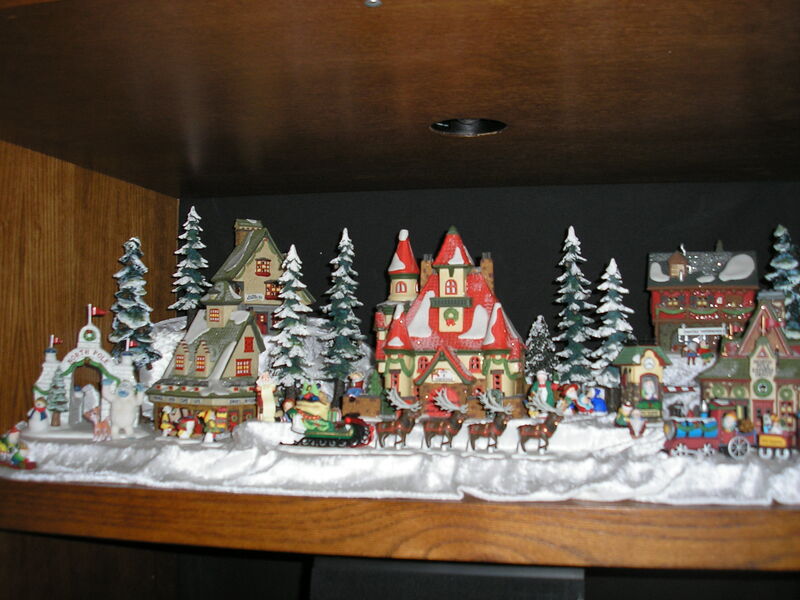 Another alternative to showcase a special ornament is with a tabletop ornament hanger. 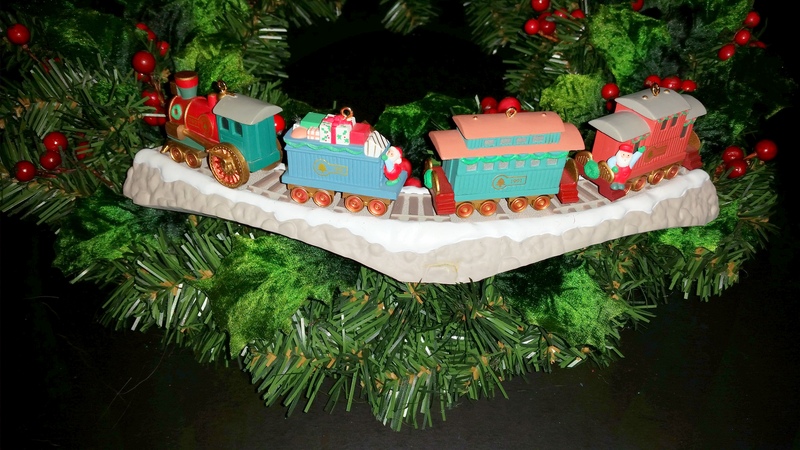 These are usually sold during the holiday season and feature a long curved hook to hand the ornament from and come in a variety of finishes – metal, glass, etc. I use something a little out of the ordinary, pocket watch display domes – a glass dome with hook at the top and a wood base. They work perfectly as an ornament hanger. Hallmark and Enesco creates wonderful ornaments every year. Some of those ornaments are very collectible and available in different themed series. 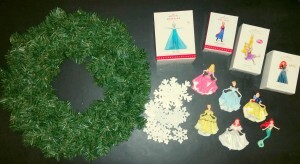 Every year another ornament in the series is available and soon you can have a collection of several wonderful themed ornaments. 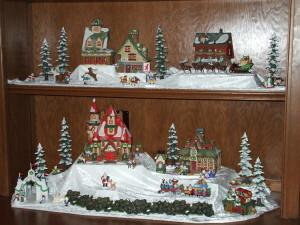 If you display the collection on the Christmas tree separately, they could get lost with all the other ornaments. Consider highlighting the collection and displaying them together on a themed Christmas wreath. Tied to a luncheon or dinner napkin, use as a party favor for guests to take home. Use as a gift wrap accessory and tie to a present for the perfect finishing touch. 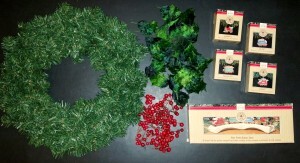 Hang from the under a kitchen cabinet as simple holiday decorations. NOTE: don’t hang too low to interfere with working on the kitchen counters. 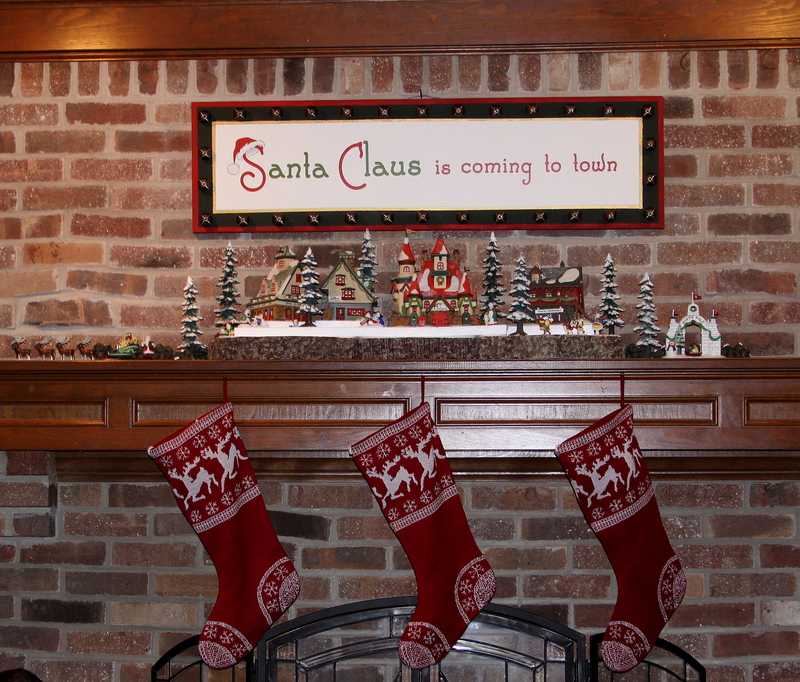 Hang from a pine garland to add an extra festive touch to a fire place mantel. Hang ornaments from garlands draped on top of the bathroom mirrors. 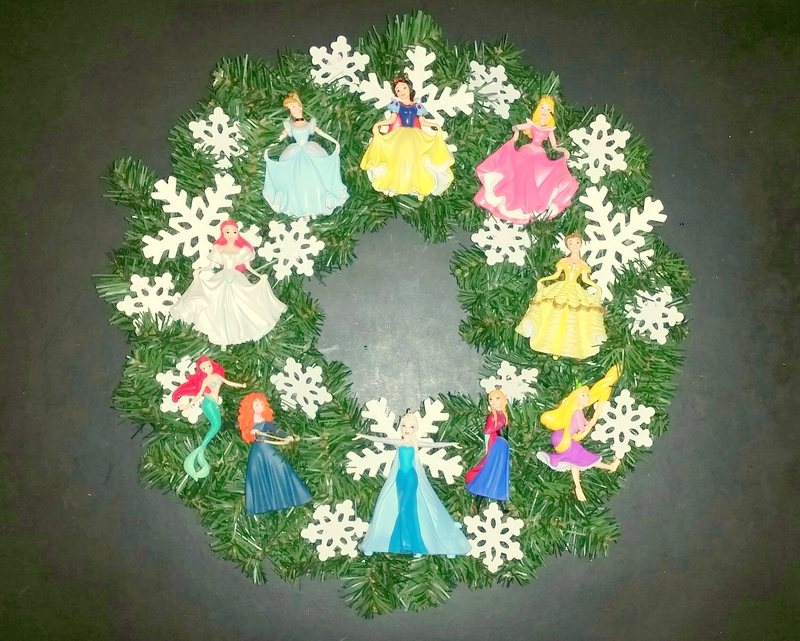 There are so many different ideas for using Christmas ornaments in unexpected ways and you are only limited by your imagination and creativity!! 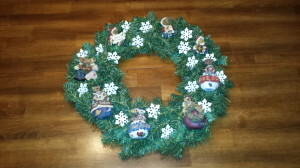 Please send your comments and suggestions; I would love to hear your ideas of other uses for Christmas Ornaments.